My mom used to say that red looked good on me and when I was a kid I was drowning under cherry-color clothes: socks, jumpers and even hair pins. You'll find raspberry vinegar quite often here, used as a condiment for salads. To be honest I like it thousands times better than any other kind of creamy dressing of ambiguous colors. Its gorgeous color and sweetish taste go very well both with a simple mixed greens-arugula salad and with fancier creations like the watermelon-feta mix or those yummy salads with caramelized nuts and goat cheese. And then, don't you go crazy for this color as well? Choose ripe but firm raspberries, wash them carefully and pat them really dry. Mix them with the vinegar and few peppercorns if you wish. Put in a container and let rest for one month in a cool place. Stir every 3 or 4 days, to mix the fruit better. 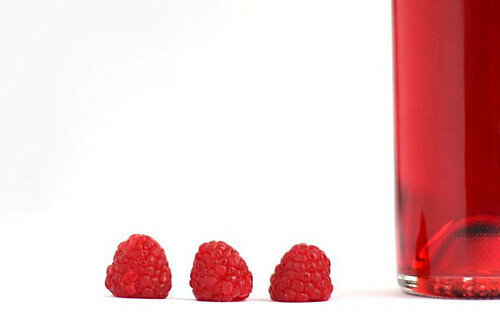 When it's ready, strain, discard the raspberries and pour in a bottle. Just wanted to let you know that your blog is comming up great- love it, love it , love it. Ehi Orlev, I sure didn't know that! Ehi, waiting for upstairs girl to start her blog. Tell her it's really rewarding. كما أننا قررنا أن نغير تفكيرك عن افضل مؤسسة بخ مبيدات بالمدينة كلياً و أسسنا مؤسسة الماسة أفضل مؤسسة بخ حشرت فى جده وباقي المدن المملكة العربية السعودية والتى تقدم خدمات ممتازة لا مثيل لها فى في مقابل أسعار متوسطة لا تعتبر ثقل على كاهل رب العائلة وليس مهتم اننا نقدم خدمات رخيصة أننا نتهاون خلال تقديم عملنا في مكافحة هامة بخ المبيدات أو نقصر في أعطائك نتائج جيدة لكن بالعكس فنحن نعطي ضمان كامل للدفاع عن منزلك وأسرتك من خطر الزواحف والفئران وكل انواع الحشرات.